Air pollution in China is a critical global health problem, responsible for somewhere between 700,000 and 2.2 million premature deaths annually. The largest single contributor to air pollution-related mortality is particulate matter below 2.5 microns in size, or PM2.5. Exposure to PM2.5 has been found to increase the risk of heart attacks, strokes, lung disease, and lower respiratory disease based on a number of longitudinal studies around the world comparing populations with differing levels of exposure. China is the world’s largest consumer of coal, and coal is responsible for the vast majority of electricity generated in China. I’ll argue that replacing coal-based generation with low-polluting alternatives like nuclear, natural gas, or renewables could save between 200 and 1,000 lives per gigawatt-year. 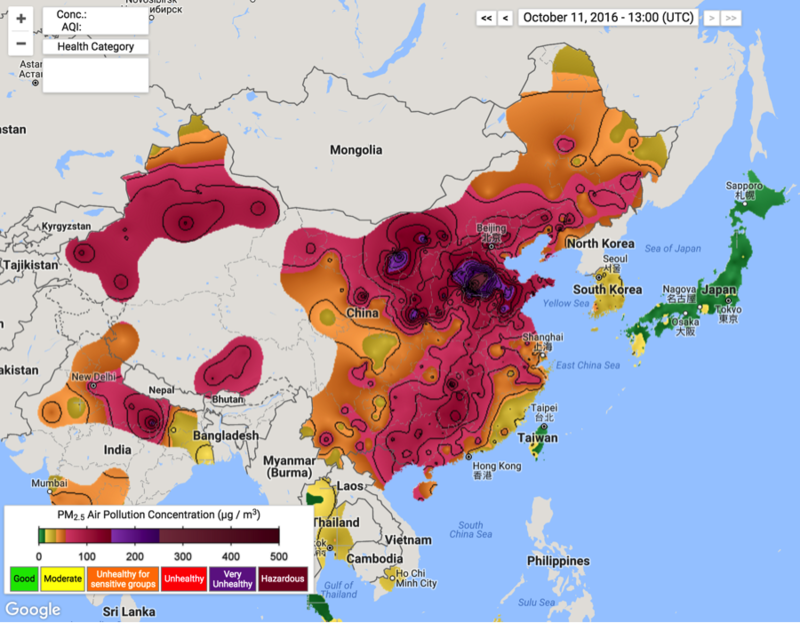 China has, on average, among the worst air pollution of any country in the world. Many of the areas of the country have PM2.5 levels that rank on average (using the U.S. EPA rating scheme) as “Unhealthy”, with spikes up to “Very Unhealthy” or “Hazardous” as relatively common occurrences. Occasionally cities in China will experience air pollution levels literally off the charts, with PM2.5 concentrations reaching levels of 1,000 or more micrograms per cubic meter (µg/m3)—the standard health scale ends at 500 µg/m3. The image below, from Berkeley Earth’s real-time air pollution monitoring of China, shows PM2.5 levels on a typical fall day. A large portion of PM2.5 in China comes from coal use. When coal is burned, it both directly releases particulate matter as a result of incomplete combustion and releases sulfur dioxide, nitrogen oxides, and black carbon that serve as important precursors to atmospheric PM2.5 formation. In many cases this secondary formation is more important than direct PM2.5 emissions from coal. Approximately 55 percent of coal consumed in China is used to generate electricity provided to the grid. 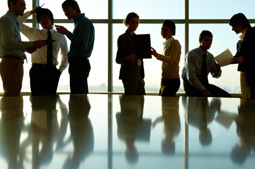 40 percent is consumed in industrial processes, while around 3 percent is used in the residential sector (with the remaining 2 percent consumed by commercial and other). China generates approximately 3,700 terawatt-hours or 422 gigawatt-years (GW-years) of electricity from coal annually. Determining the contribution of coal-based electricity generation to PM2.5-related mortality requires estimating what percent of total PM2.5 in China comes from coal-fired power plants. A recent study by the Health Effects Institute and Tsinghua University performed extensive atmospheric modeling of PM2.5 sources to attribute overall concentrations. It found that about 40 percent of total PM2.5 could be directly attributed to coal. Of this, about 21 percent came from industrial uses (steel production, for example), 12 percent came from power plant coal, and 6 percent came from domestic coal burning (for space heating). It is important to note, however, that they assumed widespread use of scrubbers for electric power production; if the use of scrubbers is low then a larger fraction of the observed PM2.5 would be attributed to coal use. The breakdown of PM2.5 by source is shown in the pie chart below, both for the high power-plant scrubber use scenario put forward by the Health Effects Institute and a low scrubber use scenario that assumes power-sector emissions are more similar to those of industry. Figure 2. Breakdown of estimate PM2.5 contributions by source in the Burden of Disease Attributable to Coal-Burning and Other Air Pollution Sources in China study from the Health Effects Institute and Tsinghua University in the High Scrubber Use scenario. The Low Scrubber Use scenario shows estimated contribution percentages if power plant emissions were more similar to industrial sector emissions. The Health Effects Institute also provided an estimate of total mortality from PM2.5 of 916,000 deaths per year (with a remarkably narrow uncertainty range of 820,000 to 993,000), a mortality that is smaller than the prior Berkeley Earth estimate of 1.6 million, although within the published uncertainty range (700,000 to 2.2 million). Assuming that 12 percent of PM2.5 (and thus 12 percent of PM2.5 mortality) is attributable to coal-based electricity generation, we can estimate deaths per gigawatt-year (GW-year) as 260 (uncertainty range 233 to 282) using the Heath Effects Institute numbers and 454 deaths per GW-year (uncertainty range 199 to 625) for the Berkeley Earth numbers. It is somewhat interesting to note that while both power generation and industrial sectors consume comparable amounts of coal, the PM2.5 contribution from the industrial sector is twice that of the electricity sector in the Heath Effects Institute model. This is largely due to assumptions regarding the utilization of emissions control technologies like sulfur, nitrogen, and PM2.5 scrubbers. 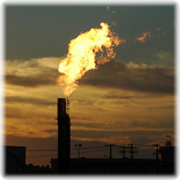 Nearly all power plants are assumed to use scrubbers, while use in the industrial sector is more spotty. However, there is strong reason to believe that the actual utilization of scrubbers by power plants is much lower than officially reported. Operation of scrubbers consumes a non-negligible amount of energy, and there have been numerous reports of plant operators shutting down scrubbers to increase profits when they can get away with it. While China has started to crack down on this behavior, it is likely that actual scrubber use is still well below the 90+ percent assumed. We can get an estimate of the mortality contribution of coal-base electricity generation when scrubbers are not fully utilized by examining a case where coal power plants had the same PM2.5 contribution as industry. While this is likely not true across the entire power sector, it may well be the case (or even a conservative estimate) for individual plants. This still results in effective power-sector emissions per ton of coal that are around 30 percent lower than for the industrial sector, as more coal is consumed in the power sector. If the power generation sector has emissions similar to the industrial sector, deaths per GW-year would be 456 (412 to 497) for the Heath Effects Institute mortality model and 745 (326 to 1025) for the Berkeley Earth model. These results are illustrated in Figure 3. Figure 3. Estimated mortality per gigawatt-year of coal-based electricity generation attributable to PM2.5. 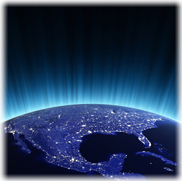 Both estimates from the Health Effects Institute and Berkeley Earth are shown. The high scrubber use scenario follows the Health Effects Institute assumptions, while the low scrubber use scenario assumes emissions allocation similar to the industrial sector. Both published error bars (solid bars) and estimated error bars using the mortality impact uncertainty in the Berkeley Earth approach (dashed bars) are shown for the Health Effects Institute numbers. 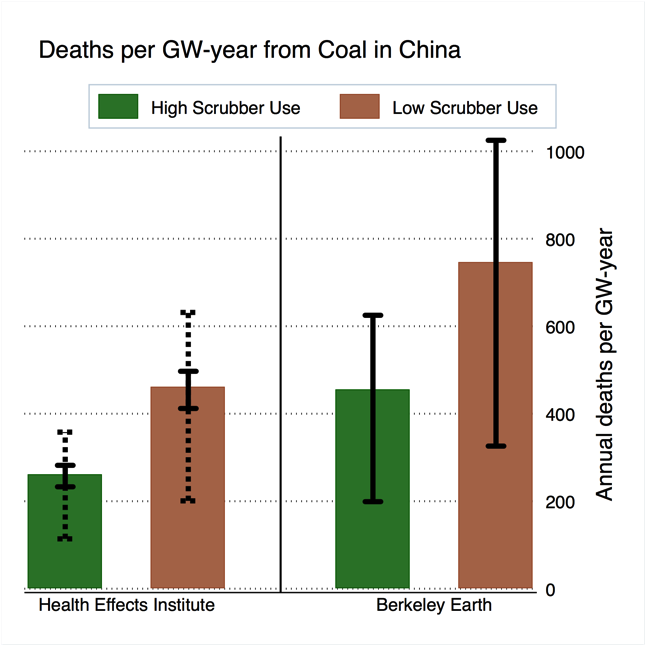 Other studies conducted on mortality impacts of coal-based generation outside of China have found comparable results. A 2007 article in The Lancet estimated a mortality rate per GW-year of 202 for the U.K. and an average value of 231 globally. These estimates are noticeably lower than most of the estimates we consider for China, though they overlap with the low end of our values. This discrepancy might be due to two factors: first, there is reason to believe that emissions control technologies are in more widespread use in places like the U.K. and other parts of the world than in China. Second, the mortality estimates will be impacted by population density, with coal generation located in coastal China (where plants are primarily concentrated) having a much larger exposure impact than in most regions of the world. Ultimately, at 422 GW-years of electricity produced annually from coal, we can bound Chinese coal-generation-related deaths at between 84,000 (200 deaths per GW-year) and 434,000 (1025 per GW-year). The consumption of coal for electricity generation thus has large negative public health implications for China. Moving to away from coal and toward alternatives like nuclear, natural gas, and renewables such as solar and wind, would not only reduce China’s greenhouse gas emissions but also save lives.